Exceptionally brilliant, masterful and rewarding – and here it is from the mighty pen of novelist Jack Engelhard, the highs and lows, warts and all of making it as a writer. Here the sweetness of success is given its proper place, as are the moments of failure and despair, and you will never forget the refrain, especially if you're a writer, "Nobody cares." Engelhard opens the door into the world of New York publishing with equal access into the world of gambling and casinos. Slot Attendant is a triumph, and an absolute must-read. "Jack Engelhard combines personal experience, the experience of others, and a truly vivid, thoroughly grounded imagination to paint this compelling portrait of a novelist. The dialogue is sharp and engrossing. The elements of both mystery and deeply personal conflict are introduced and compelling from the very beginning. The ending is anyone’s guess, and guess you will....it’s guaranteed. Yet no wisdom was ever imparted more entertainingly...not to mention at times emotionally. For a quick, brisk read brimming with pathos and dignity, humor and mystery, hope and despair, love and lust, corporate autocracy and little guys who won't knuckle under....you don't want to miss Slot Attendant." "Engelhard takes you on a literary cruise. Truly the author of this era." 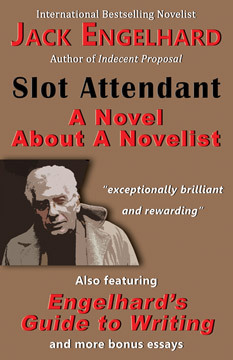 "Slot Attendant is a page turner. You won't be able to put it down. It is such a fantastic read that I wonder, can any reviewer ever do it justice?" "With his usual energetic ease of edgy, efficient expression, Engelhard's Slot Attendant provides an electrifying, edifying, and entertaining read." Contemporaries have hailed novelist Jack Engelhard as “the last Hemingway” and of being “a writer without peer and the conscience of us all.” The New York Times commended the economy of his prose... “precise, almost clinical language.” His bestselling novel Indecent Proposal made him internationally famous as the foremost chronicler of moral dilemmas and of topics dealing with temptation. Works that followed won him an even greater following, such as Escape From Mount Moriah, his book of memoirs that won awards for writing and for film. His latest novel Compulsive draws us into the mind of a compulsive gambler in a work stunningly brilliant and original, and seductively readable. Engelhard writes a weekly column for The Washington Times. Mention the title, author and/or ISBN 978-1-77143-111-8.